What spice represents Christmas for you? Ginger (Zingiber officinale) because of its importance in the international gingerbread house construction industry? Cinnamon, the dried bark of the Sri Lanka tree Cinnamomum verum, as an essential ingredient for Christmas candles, cookies and tea? For me it is Star Anise, the dried fruit of the Chinese evergreen tree Illicium verum, mainly based on its appearance (yes, I am a superficial spice appreciator). It’s just so pretty! 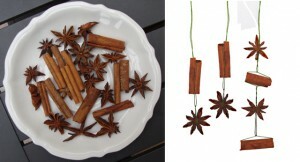 Using cinnamon sticks and star anise you can make very nice holiday decorations, as shown in this tutorial. Christmas without spices just wouldn’t be the same! What is your favourite Christmas spice? Cast your vote now!